The runtime layer receives a program in the form of a JobGraph. A JobGraph is a generic parallel data flow with arbitrary tasks that consume and produce data streams. Both the DataStream API and the DataSet API generate JobGraphs through separate compilation processes. The DataSet API uses an optimizer to determine the optimal plan for the program, while the DataStream API uses a stream builder. 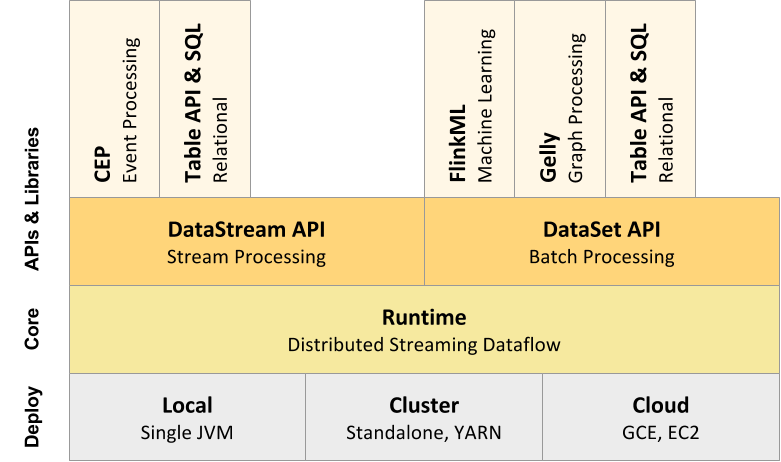 Libraries and APIs that are bundled with Flink generate DataSet or DataStream API programs. These are Table for queries on logical tables, FlinkML for Machine Learning, and Gelly for graph processing. You can click on the components in the figure to learn more.